John 4:20 Our fathers worshipped in this mountain; and ye say, that in Jerusalem is the place where men ought to worship. 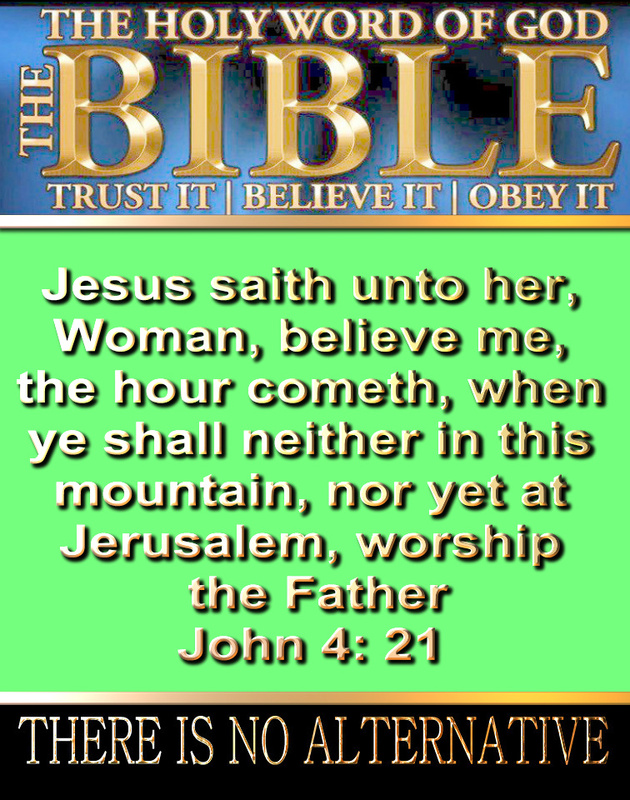 21 Jesus saith unto her, Woman, believe me, the hour cometh, when ye shall neither in this mountain, nor yet at Jerusalem, worship the Father. 22 Ye worship ye know not what: we know what we worship: for salvation is of the Jews. 23 But the hour cometh, and now is, when the true worshippers shall worship the Father in spirit and in truth: for the Father seeketh such to worship him. 24 God is a Spirit: and they that worship him must worship him in spirit and in truth. Common, among amongst some Evangelicals is a to accept the idea of a literal understanding of the Bible and to here have interest in matters supposedly prophetic, is the false belief that before Jesus returns there will have to be a new (or rebuilt) temple in Jerusalem. ; Did Daniel, Apostles Paul, John, and Jesus all specifically predict a third Jewish temple? Really now! Did any of them? ; Jesus Himself, however, specifically warned against taking the traditions of Jewish religious teachers above those of the Bible Mark 7: 7 Howbeit in vain do they worship me, teaching for doctrines the commandments of men. The Third Temple, or Ezekiel’s Temple is a Jewish Holy Temple architecturally described and prophesied in the Book of Ezekiel, a house of prayer for all people with a sacrificial service. It is noted by Ezekiel as an eternal edifice and permanent dwelling place of the God of Israel on the Temple Mount in Jerusalem? Forget anything the Torah or the Talmud Teaches.. rather always see the New Testament for the right answers.. Thus, clearly Paul’s writings regarding the temple have to do with Christian people and not a Jewish building. And while I do believe that the Bible should normally be interpreted literally, it is clear that the Apostle Paul repeatedly used the term “naos” metaphorically to refer to true Christians. Now there is still no verse at all in the whole New Testament by Jesus that is referring to a Jewish temple being rebuilt related to the Tribulation (nor byPaul or Daniel for that matter). Carefully notice that no temple of any kind is mentioned in this passage. Bible literalists should realize that perhaps a future Jewish physical temple is not being referred to by Jesus here, but that Jesus is referring to either the area the temple was originally built at or to the city of Jerusalem. Notice that while those scriptures are referring to sacrifices, neither one of those passages says anything about a temple being built or involved. It should be understood that the Bible itself nowhere teaches that animal sacrifices require a temple in Jerusalem. Until Solomon built the first temple (1 Kings 6:14), the Bible shows that the Jews sacrificed on altars. David, Solomon’s father, for example sacrificed on an altar (2 Samuel 24:25), as did Aaron and his descendants (Exodus 20:24; Leviticus 1:10-11). And prior to all of that, Abel (Genesis 4:4), Noah (Genesis 8:20), Abraham (Genesis 22:9-13), and others sacrificed animals to God. So for over 3,000 years, animal sacrifices were offered without a Jewish temple. The Bible is clear that a third temple will eventually exist in the Millennium? (Ezekiel 40-48), but it is still only clearly in existence after Christ returns (cf. Ezekiel 48:35). it should be added that even among earlier professors of Christ there has long been the view that another Temple would NOT be rebuilt. There are a variety of positions taking in human commentaries even on Revelation 11:1-2. But we do not put our trust in any commentaries but only in what the Holy Spirit teaches us. “One explanation is that Revelation 11:1 is not referring to a physical building whatsoever, and instead is referring to the group of Christians which are protected during the tribulation (Revelation 12:14-16). The related explanation for Revelation 11:2 in that case would be that those “the court outside the temple” are the Christians that were not protected, but will be subject to Satan during that same time (cf. Revelation 12:17) The other explanation is that Revelation 11:1 may be referring to a building which becomes the center for Christian worship by those protected during the Great Tribulation. This would seem to allow it to be understood fairly literally as there are people worshipping there” But even if there are better explanations, Revelation 11:1-2 simply does not support the view that a Jewish temple must be rebuilt. Now when Jesus comes again, where does He go? The Mount of Olives should NOT be confused with the Temple Mount as it is a different mountain/hill. The Mount of Olives was never the site of any accepted Jewish temple. And a 3rd temple it is not absolutely required to be built in order for end-time prophecies to be fulfilled. You can be the temple of the Living God if you accept Jesus Christ as Lord and His Holy Spirit as well. This entry was posted in Christian, Christian Life, Christianity, Relgious Christianaty and tagged Bible, Christian, Christianity, church, Deacons, Elders, faith, God, Holy Spirit, Jesus, Jesus Christ, Life, pastors, religion. Bookmark the permalink. 18 Responses to Where should we worship God?